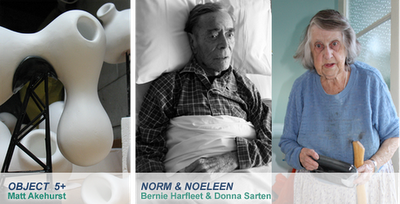 Bernie Harfleet and Donna Sarten present a charged collection of documentary photographs as part of the Auckland Photography Festival while Christchurch-based sculptor Matt Akehurst reveals the latest editions in his series of biomorphic sculptures at Corban Estate Arts Centre from 1 June – 8 July. Object 5+ by Matt Akehurst features a selection of white ambiguous forms encased in vitrines and mounted on plinths. With their small scale and specimen-like presentation, Akehurst’s Objects take on an anthropological quality while simultaneously alluding to the reclining figures of prodigious modernist sculptor Henry Moore in their fluidity. Akehurst is an active member of Arts Voice; an organization dedicated to serving the Christchurch arts community, and will be presenting a talk about his exhibition as well as the current state of the creative arts in Christchurch. Part of the Auckland Festival of Photography 2012, Norm & Noeleen from Bernie Harfleet and Donna Sarten are two personal photographic series follow the demise of the artists’ adopted parents and serve as a reminder to viewers of the disempowerment age can bring. These poignant photographs are heartening in witnessing the determination of these two individuals to maintain some independence by staying in their own homes; however viewers will be simultaneously affected by this look into the inevitable future of humans – that of increasing health issues and death. A range of public programmes will accompany these exhibitions. Please see our website for further details: www.ceac.org.nz. Anne-Sophie Adelys’ latest exhibition Re-Collection (on view at Corban Estate Arts Centre April 20th – May 27th 2012) is precisely that – a collection of disparate objects assembled together to create an installation which inevitably resonates with the viewer in their familiarity and sentimentality. 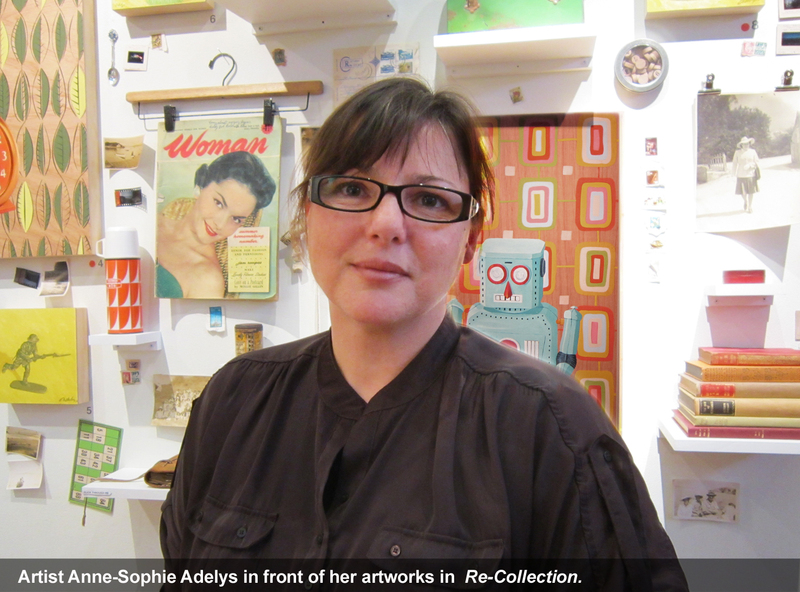 Originally from Brittany, France, Adelys incorporates found objects picked up in vintage stores or local markets with precious items from her personal collection in a frieze of colour and time, interspersed with her own retro-themed oil paintings. After studying art at the Ecole des Beaux Arts in Le Mans, graduating with a Diplome National d’Arts Plastiques, Adelys worked in the graphic design industry which has leaked into her artistic practice most obviously in her preparatory sketches which she executes in Photoshop. This inevitably results in crisply finished compositions which go beyond the realistic into the domain of the idealised. Through my work I try to re-connect with the feeling of childhood when everything and anything was possible and when life was much simpler. I want to open a small window on 'what used to be' and allow a kitsch-retro visual escape back to childhood. With artistic influences such as Edward Hopper, Mark Rothko and Norman Rockwell, it is no surprise that the artist hopes visitors respond emotively to the work she creates – her obsession with colour and its ability to communicate/evoke a particular message or feeling has a significant impact and one can see in her paintings that each colour relationship has been carefully planned and implemented. Adelys plans to continue this thread of exploration in her next series of works, potentially incorporating vintage photographs into her installations. She is in the process of applying for residences throughout New Zealand and preparing submissions for national art awards. Visit her website www.adelys.co.nz for further examples of her artwork. Vaimoana Eves’ exhibition Play Space, currently on view at Corban Estate Arts Centre, stemmed from the artist’s desire to touch and explore the inaccessible creations of her favourite artist Sarah Lucas. This yearning to get inside the biomorphic forms caused Eves to reassess her art practice and inspired her to incorporate interaction into her installations: “The stuffed stockings seemed to be transformed into the look of marble and immediately reminded me of classical sculpture although I knew they weren’t. I so wanted to touch and explore these exquisite works, but knowing the rules of the gallery I was forbidden.” The main focus of Play Space is active play: by abstracting sport and games and their relationship to the body Eves has created three separate pieces which can be stretched, pulled and tugged – in a similar vein to sporting activities – by the physical body. To emphasise the arena-like transformation of the gallery space, a slightly off-centre circle has been taped to the floor – big enough for a person to stand in – which could be utilised as a point of reference to stand and throw from, much like the centre circle on a netball court. An over-arching concept behind Eves’ art is using play as a means to learn more about ourselves, others and the world we live in. Her principal wish is that the participant has some sort of connection, with the present moment or with the immediate physical environment, through their own experience. This active engagement with the artworks – either singularly or as a whole - will hopefully remind visitors that play is both physical and social, and ultimately a very human experience. 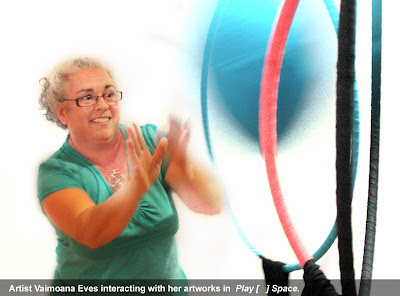 Play Space perhaps best elucidates Eves’ artistic, and personal, influences, which is society itself and the social engagement between individuals. Her upbringing and family have a lot of influence on how and what she makes, with her work frequently incorporating memories from her childhood and investigating how they have shaped her artwork today. Texts on philosophy, phenomenology and anthropology have supplemented these inspirations, with writers such as Julia Kristeva leading Eves to incorporate the abject as a device to draw people into her work, particularly the sense of play, fun, humour and even slapstick. Artists such as Larissa Kosloff, Pipootti Rist and Hayley Newman similarly employ humour and playfulness in their practice and Eves looks to them, as well as a host of other conceptual artists including Hannah Wilke, Yayoi Jusama, Annette Messager and Ana Mendieta, as creative influences. Currently in the midst of a Master of Design at Unitec, Eves has dabbled in several art courses in Australia and New Zealand – often juggling full-time work and studying. At present her preferred media are sculpture and installation, particularly constructing objects from fabric and suspending them from ceilings and walls. The exhibition space is a significant influence on Eves’ artwork, with nothing set in concrete until the artist is working the site itself. This ties in with Eves actively incorporating the use of all senses in her pieces, in the hopes it will enhance as well as open up different levels of meaning simultaneously, thus prompting engagement with the work. Next up for Vaimoana is preparing for her final master’s show which will be a selection of past and new work. It has been an invaluable experience for Eves to exhibit Play Space at Corban Estate Arts Centre as it has allowed her to see how visitors interact with the sculptures and enable her to refine the final submission for her Master’s.